We’ve been shortlisted for a One Dance UK Award! 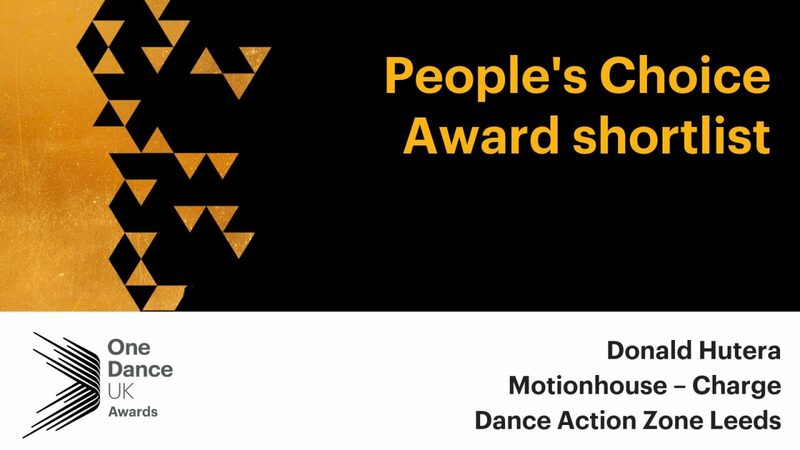 We’re very excited to announce that we have been shortlisted for One Dance UK’s People’s Choice Award for our production, Charge along with the brilliant Donald Hutera and Dance Action Zone Leeds. Specifically designed to recognise the outstanding contribution of people working in dance, the annual event is an opportunity for people in the industry to unite and celebrate the excellent work of dance artists, teachers, practitioners, educators, schools, choreographers, companies, venues, scientists, and writers who have made an impact on the UK dance landscape. A panel of judges, drawn from the dance sector reviewed over 800 nominations to arrive at a shortlist of 3 nominees for each category, so we really do feel honoured to have been acknowledged for our efforts in the dance industry amongst so many other fantastic nominees. The final winners will be announced at an Awards Ceremony on 24 November 2018. We’ll be sharing updates on the night on our Facebook and Twitter pages. Wish us luck!